Preparing the perfect holiday meal can be an overwhelming task, even for the most seasoned of chefs. But what happens when one of your guests is undergoing cancer treatments? While going through radiation and chemotherapy, some cancer patients may experience a loss of appetite and change in tastes. Old favorites may become unappetizing, and some foods may be difficult to eat. By reworking and rethinking your menu, you’ll provide a crowd pleasing, patient-approved feast without compromising holiday tradition. If you’re someone who doesn’t like to stray too far from the classics, this recipe is for you! 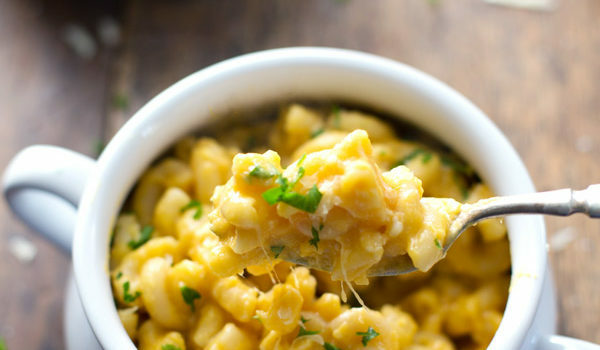 Keeping the concept the same, this macaroni and cheese recipe substitutes a healthier, but equally delicious, sauce for the extra butter and flour normally used. Destined to become a star of any table, this side dish serves as a source of necessary daily vitamins and vegetables while keeping family and friends coming back for more. Makes eight servings. Per serving: 190 calories, 4 grams fat, 4 grams fiber, 9 grams protein. Cook the macaroni according to package directions. Drain and set aside. Heat the butter in a large skillet over medium low heat. Add the onion to the butter in the pan, sautéing over low heat until fragrant and golden, about 20 minutes. Steam the butternut squash over boiling water for approximately 20 minutes or until fork tender. Transfer squash to the blender. Add the onions, milk, salt, and broth and puree until completely smooth and creamy. This should yield about 4 cups sauce. Pour the pureed sauce over the cooked noodles and add the shredded cheese. Stir to melt the cheese; add water or milk to adjust consistency as needed. Serve with salt and pepper to taste.